You’ve had one too many pineapple tarts this Chinese New Year – actually, even before the holiday started officially. And those guides on the number of calories you need to burn for each type of cookie consumed are preying on your guilt. But as much as the mind is willing, the body remains weak. Our suggestion to help you overcome the inertia and pull yourself off the couch – outdoor eye candy. Arts and culture trails, which are dotted with public art and places of cultural interest, offer a fun way to burn calories, and you can easily turn them into outings to avoid missing out on precious family bonding time over the festive holiday. So, go on, pick a route, or conquer them all. Calories are taken from HPB Online. This scenic trail, which marks the 50th anniversary of Singapore’s independence, will bring you past iconic buildings in Singapore, such as the Old Parliament House, as well as works of public art and interesting places of culture, including The Peranakan Museum, which will close for a revamp from 1 April and re-open in mid-2021. Don’t forget to pause at the Jubilee Bridge to capture a postcard view of the Civic District, and stop by Baet Yeok Kuan’s interactive sound installation, 24 Hours In Singapore, outside the Asian Civilisations Museum. 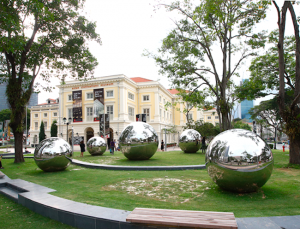 Baet’s work comprises spherical sculptures that play everyday sounds in Singapore, from chatter in the heartland to the beeps that alert commuters of closing train doors. Details on the full route here. 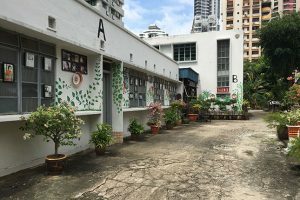 This trail is for film and culture buffs who enjoy seeking out gems in seemingly ordinary neighbourhoods. The estate is named after Joseph Balestier, the first American consul to Singapore from 1836 to 1852. Stops on the trail include historic places of worship, buildings with eye-catching architecture and key locations from Singapore’s movie-making history. A highlight on the trail is the Goh Chor Tua Pek Kong Temple, established by Hokkien-speaking workers in the 1800s. A unique feature of the temple is its plaster walls, painted red to mimic the look of terracotta wall tiles used in traditional Hokkien architecture. The elaborately carved roof ridges, depicting flora, fauna and mythical creatures, is also a stand-out feature of the building. Another hidden gem on the trail is the former Malay Film Production Studio, established by the film distribution company Shaw Organisation in 1940. 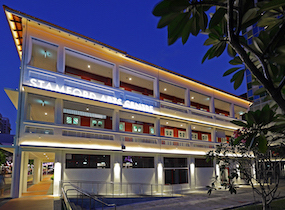 The studio produced more than 150 movies from 1941 to 1967, including the famed director and film star, P Ramlee. Details on the full route here. Art, architecture and beauty in nature make this trail unforgettable. 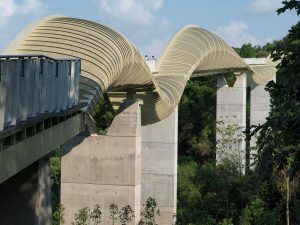 The route includes a copper-tooled mural wall that depicts Singapore’s history, the architecturally striking Henderson Wave bridge, and mesmerising songs from nature. These elements of beauty make the uphill portions of the route worth the trek. Details on the full route here.